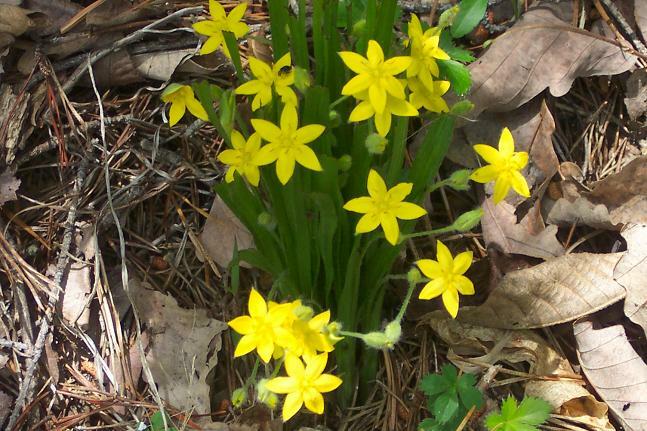 Yellow Stargrass, Hypoxis hirsuta: Blooms April to September. 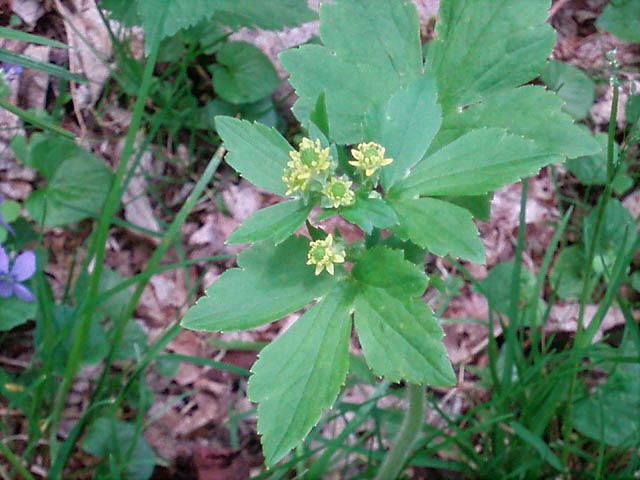 Found in open woods and dry meadows. 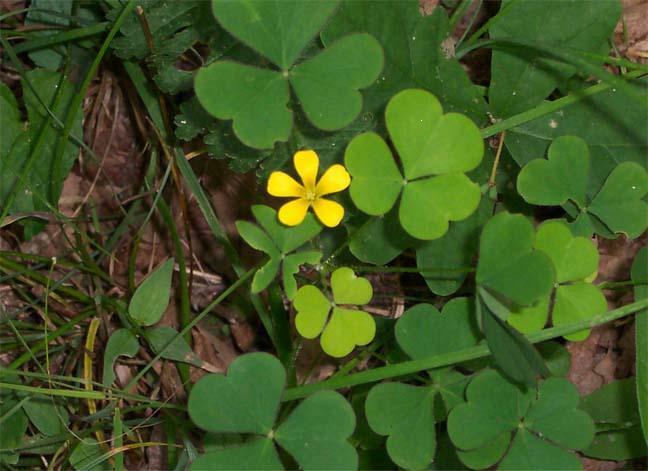 Location: Strasburg Reservoir, GWNF, VA.
Large Yellow Wood Sorrel, Oxalis Grandis: Seems to be more scarce than its Pink/purple cousin. 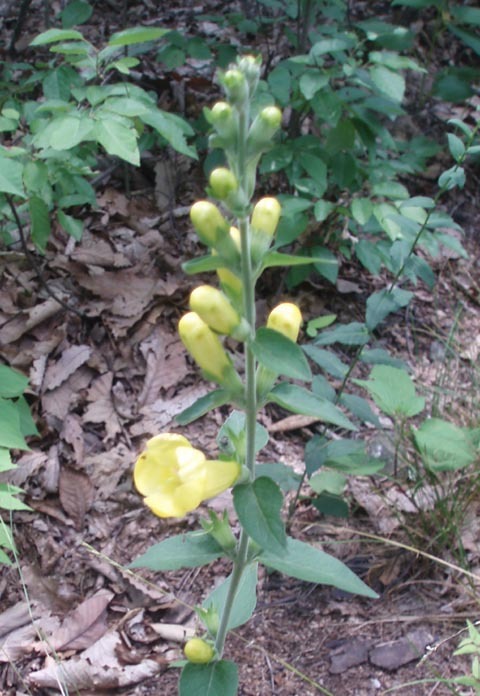 Grows in open woods and along roadsides. 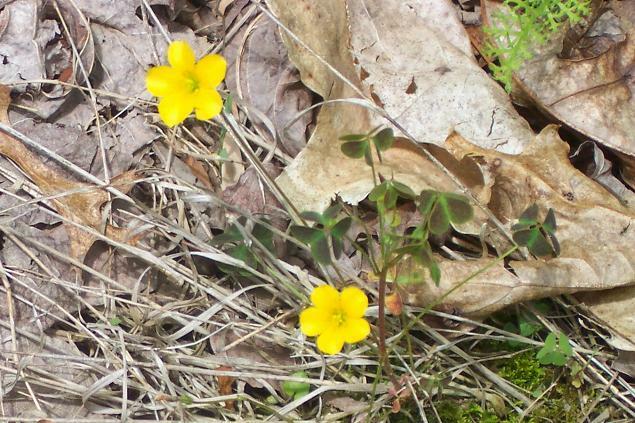 Location: Massanutten Mt Tr, GWNF, VA.
Common Yellow Wood Sorrel, Either Oxalis stricta or europaea. 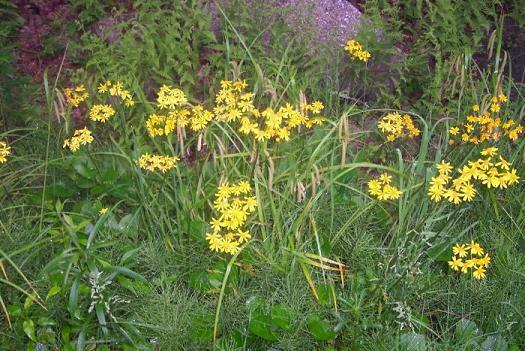 Considered a weed in gardens and sidewalks. Location: Pine Lick Trail, Green Ridge SF, MD. 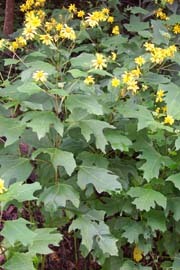 Celadine (Chelidonium majus): Blooms May-June. Can grow to 18 inches. Location: AT in SNP, VA.
Fringed Loosestrife (Lysimachia ciliata): Grows in moist areas. Location: Williams River, Tea Creek Backcountry, MNF, WV. Whorled Loostrife, Lysimachia quadrifolia: 4 leaved whorls of lanceolet leaves with small yellow flowers w/red centers under the leaves. Photo by Anita Mueller. 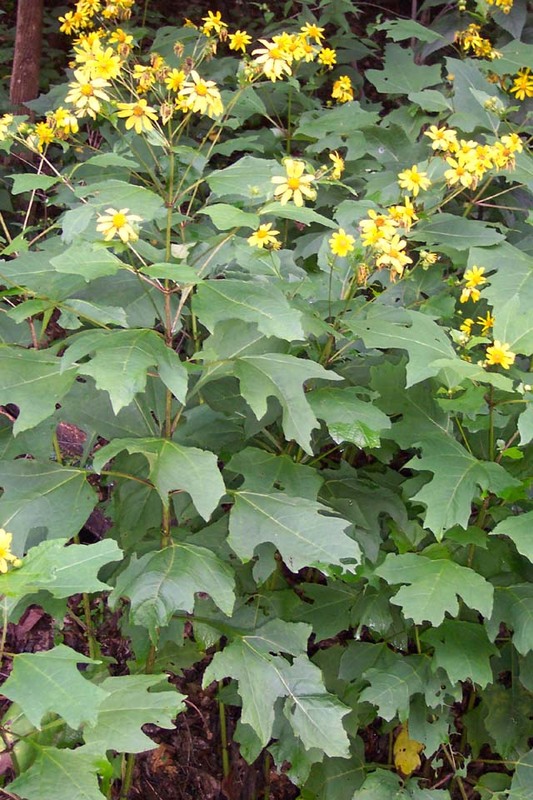 Green and Gold (Chrysogonum virginianum): Blooms in May-June. Spreads via runners and easily domesticated. Location: Jeremy's Run, SNP, VA.
Wingleaf Primrose-willow (Ludwigia decurrens): Summer bloomer. Grows 1-2 feet. Prefers wet, sunny areas. 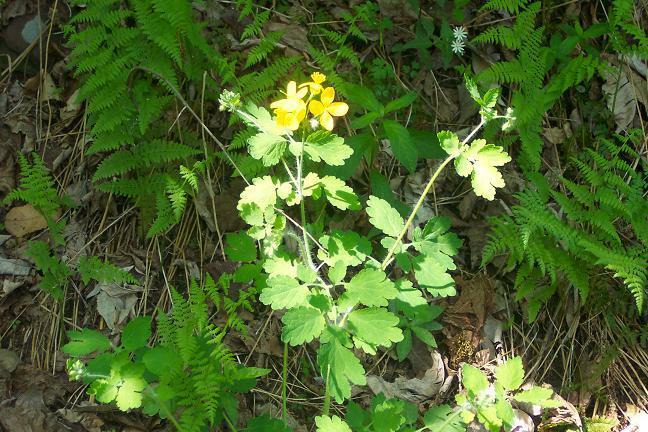 Location: Thompson Hollow Trail, SNP, VA.
Hooked Crowfoot (Ranunculus recurvatus) - a buttercup with very small flower petals and large bird's foot shaped toothed leaves. They produce seed pods that have hooked burs. Location: Seneca Creek, WV. June, 09. 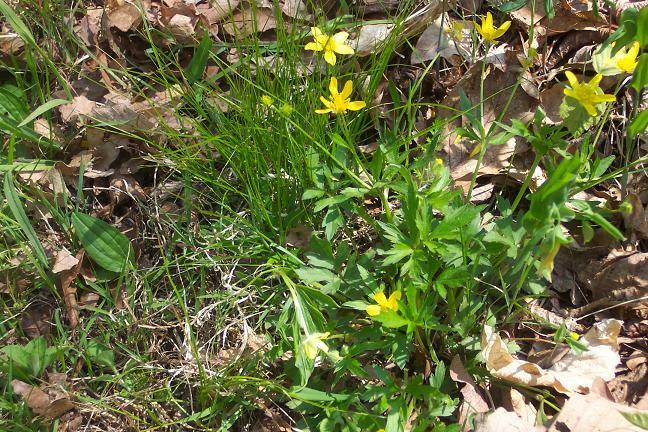 Hispid (Marsh) Buttercup (Ranunculus hispidus): Spring Bloomer, usually near water. 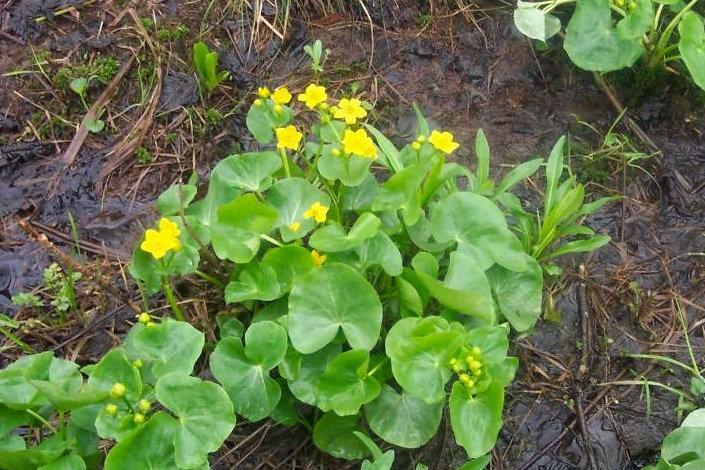 Location: Jeremy's Run Trail, SNP, VA.
Marsh Marigold (Caltha palustris): As the name implies these flowers love water. Bloom April-June. Location: Cranberry Glades, MNF, WV. 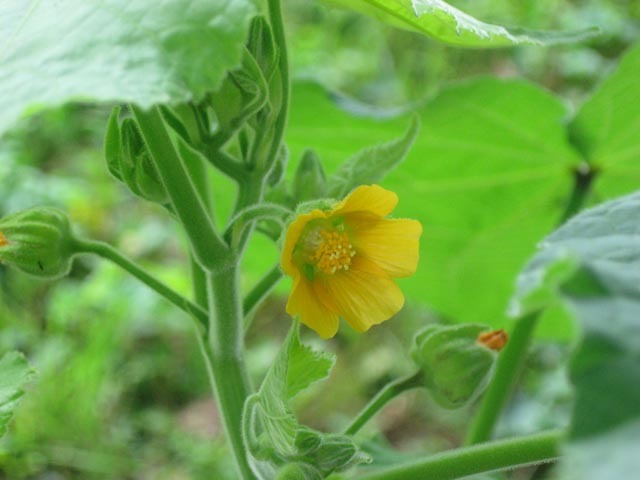 Velvet-leaf (Abutilon theophrasti): An alien. 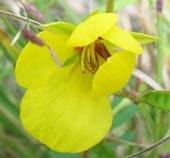 single, 5 petaled flowers in the leaf axils below very large heart shaped leaves. Photo by David Bennick. 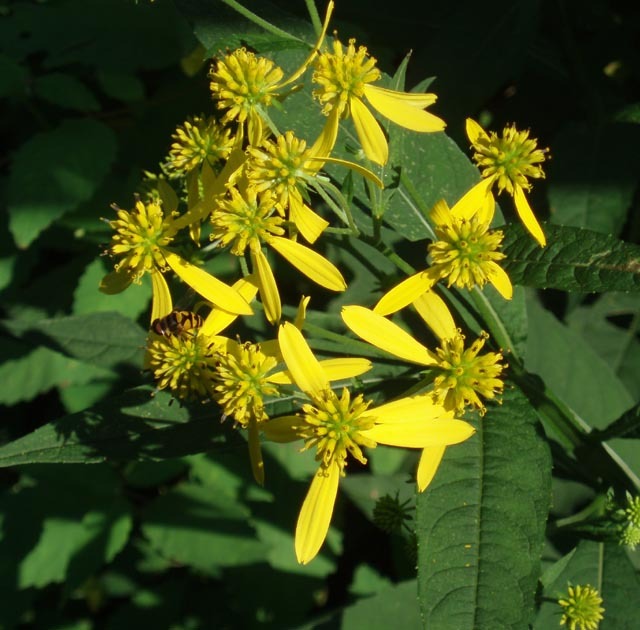 Frostweed (Helianthemus canadense): Five petals. 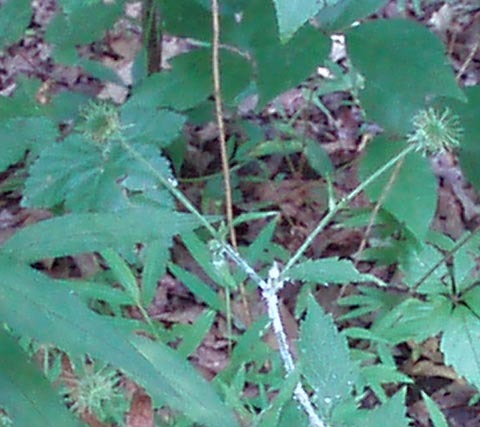 Thin alternating leaves. Likes sandy soil. Location: Sodliers' Delight, MD. Photo by Dimitri Tundra. 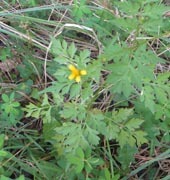 Shrubby Cinquefoil (Potentilla fruiticosa): Unlike other Cinquefoils, the leaflets of this variety are not toothed. Photo by Dave bennick. Evening Primrose (Oenothera biennis): Night-time Bloomer. Grows over 4 feet tall. Sunny, wet areas. Flower closes during the day. Location: Downs Park. 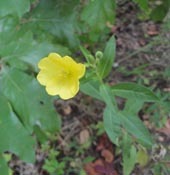 Small-flowered Evening Primrose (Oenothera parviflora): One inch flower. Not multi-branched. Leaves smaller and smoother than O. Biennis. Flower does not form a tube. Location: Downs park. 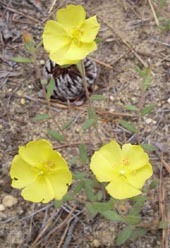 Small Sundrops (Oenothera perennis): Note the 4 notched petals and thin green leaves. A daytime blooming primrose. Location: Soldiers' Delight. Photo by Dimitri Tundra. 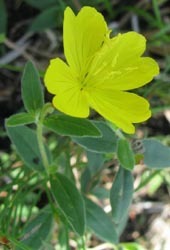 Grooved Yellow Flax (Linum sulcatum): Plant 1-2 feet tall. Flower 1/2 inch across. Dry, sandy places. Location: Soldiers' Delight, MD. Photo by Dimitri Tundra. 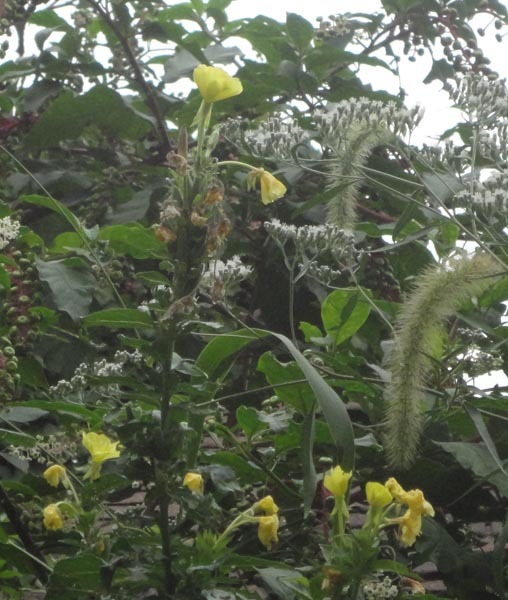 (Agrimonia parviflora ): A more erect and smaller plant than the Woodland variety. 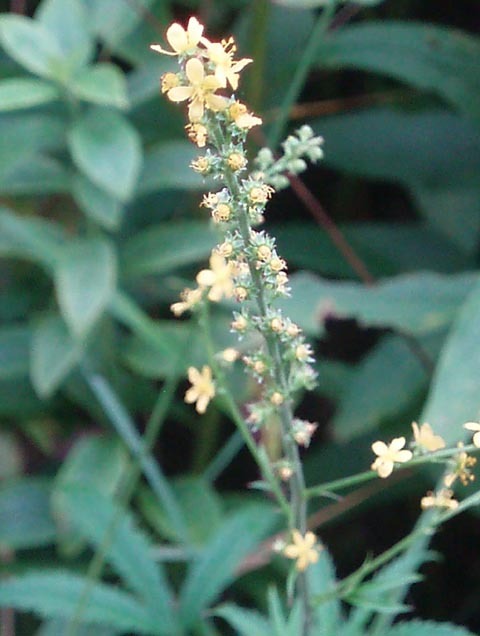 Much smaller flowers and thinner leaves. Location: Cranberry Glades, WV. 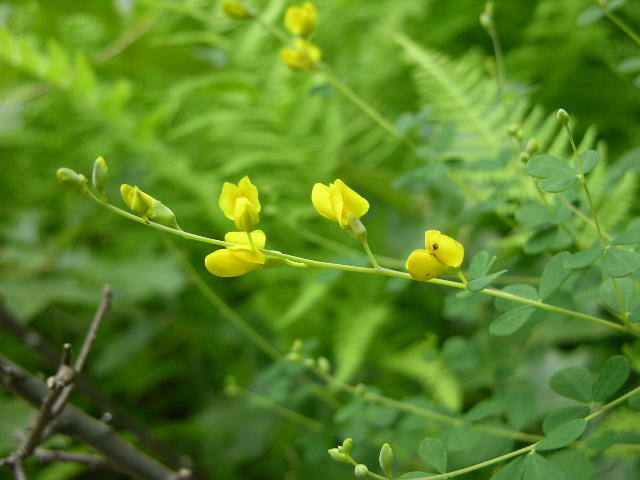 Wild Indigo (Baptisia tinctoria): Bushy shrub in the pea family. 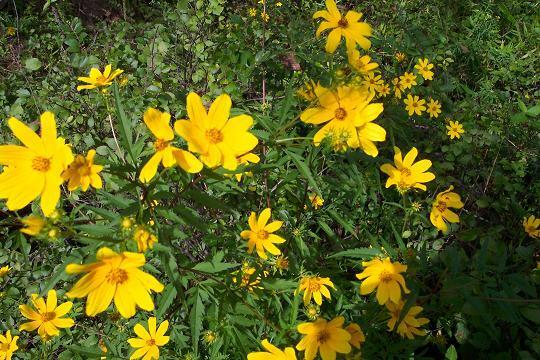 Grows along trails and roads. Location: Three Pond section of the Tuscarora Tr, GWNF, WV. Photo bt Ken Clark. 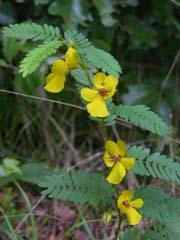 Partridge Pea (Chamaecrista fasciculata): Blooms July - August. 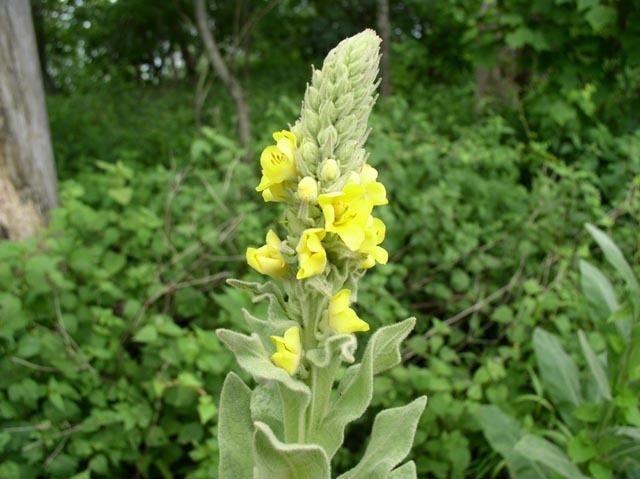 Grows in open fields. Location: Jug Bay, Patuxent River, MD. Photo by Ken Clark. Close up by Dimitri Tundra. Wild Sensitive-Plant (Cassia nictitans) Smaller flowers than Partridge-Pea (above). Phot by Dave Bennick. 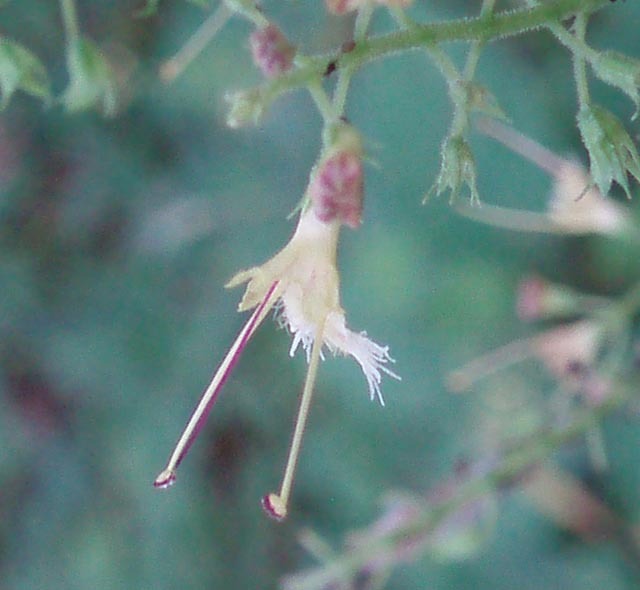 Small-flowered Leafcup (Polymnia canadensis): Similar to the above but the leaves are not winged and the petals are few or absent. When present they are very short. Found in ravinesand damp woods. Bloom June-October. Location: Seneca Rocks Trail, WV. 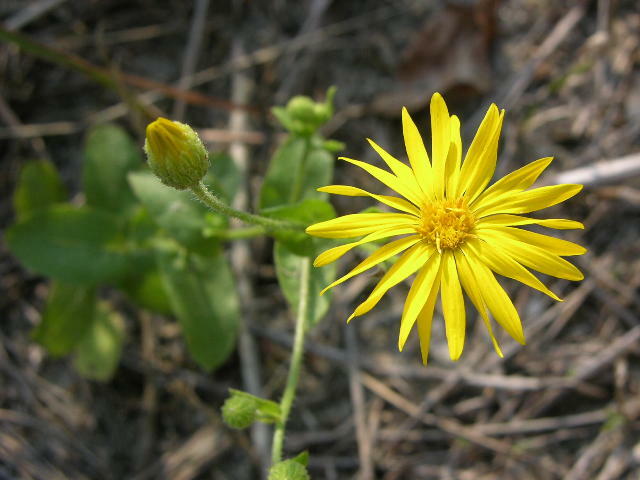 Large-flowered Leafcup (Polymnia uvedalia): Grows along roads and trails. 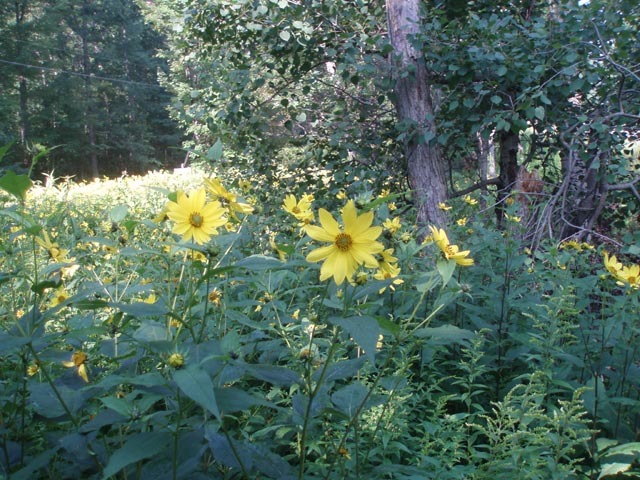 Plants can grow over 4 feet tall. The large maple/oak type leaves make these easy to identify. Location: Rt82 roadside, New River NR, WV. 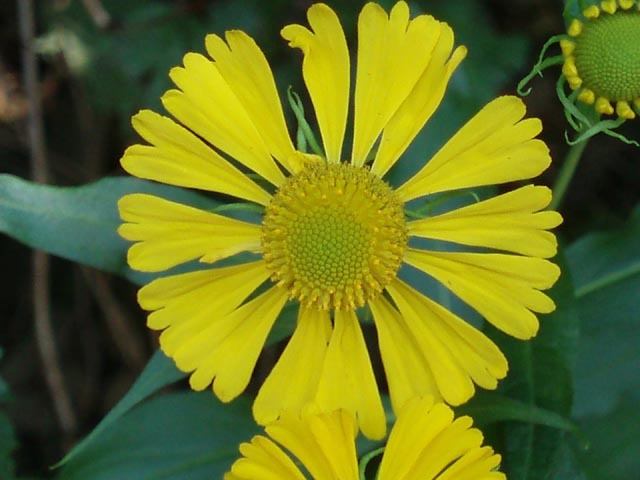 Sneezeweed (Helenium autumnale): Three lobed petals are quite distinctive. Ochre colored button. Lance shaped, toothed leaves. Swamps and wet areas. Location: Cheat River, WV. Wingstem (Actinomeris occidentalis): Few irregularly placed rays (2 - 8). 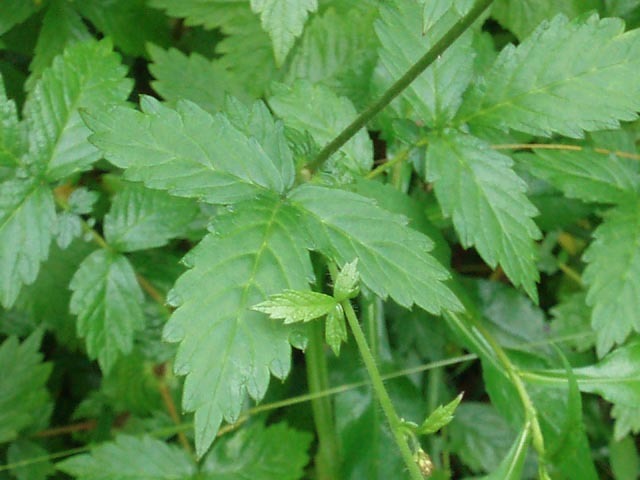 Alternating, toothed lance shaped leaves. Edges and thickets. Blooms August to September. Location: Cheat River, WV. 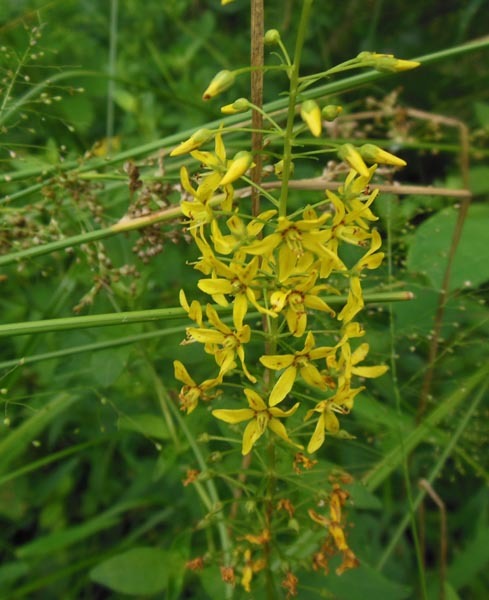 Crown-Beard (Verbesina occidentalalis): Similar to Wingstem (above) but with opposing, broader leaves. Woods/thickets. 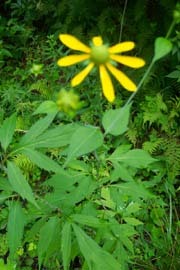 Location: AT, SNP, VA.
Black-Eyed Susan (Rudbeckia serotina/hirta): The Maryland State Flower. Prefers sunny, open fields. Location: Long Pond Tr, GRSF, MD. Photo by Ken Clark. 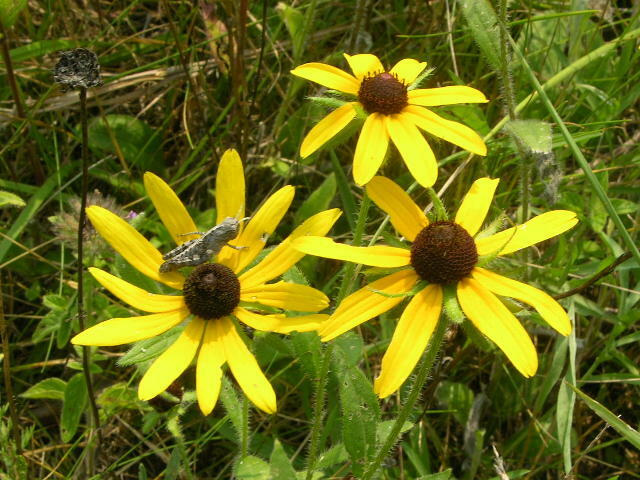 Brown-Eyed Susan or Thin-leaved Coneflower (Rudbeckia triloba): Similar in appearance to the Black-eyed Susan but the flower has more but shorter rays. Much branched with more flowers than above. 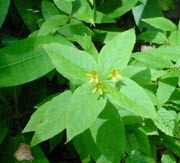 Lower leaves have three lobes. Location: Cranberry Glades, WV. Common Tansy (Tanacetum vulgare): Alien. 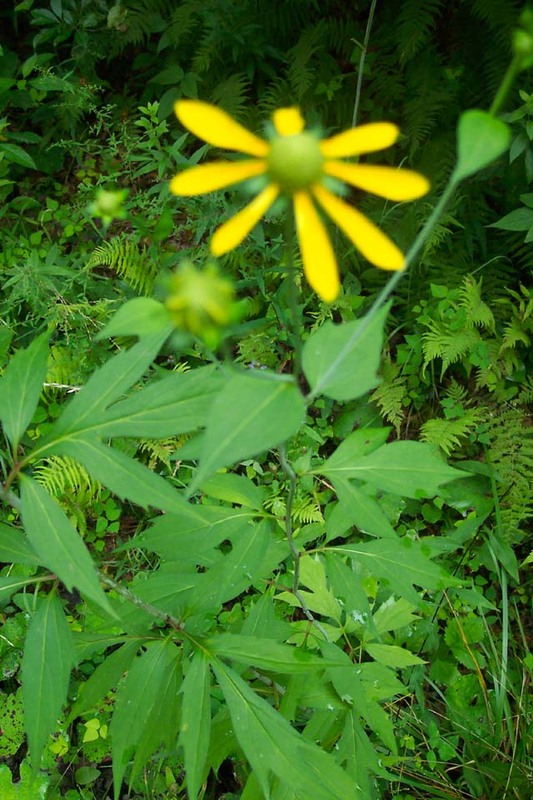 A ray-less composite in the daisy family. Note the fern-like leaves. Strongly scented. Location: Loyalsock Creek, PA. 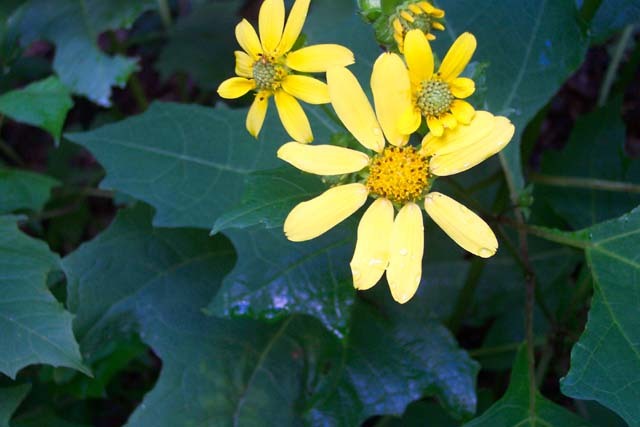 Smooth Beggar-Tick (Bidens laevis): This sunflower-like flower produces a double pronged hitch-hiker in the fall. Location: Soldiers's Delight, MD. Photo by Dimitri Tundra. 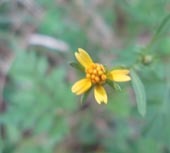 Spanish Beggar-Tick (Bidens bipinnata): Very small plant (4-6 inches) with multi-lobed leaves. Flower less than 1/4 inch with variable petals (2-5). Achenes (seeds) have four barbs. 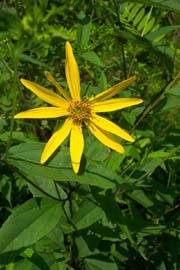 Devil's Beggar-Tick (Bidens frondosa): Petal-less flower supported by long leafy bracts. 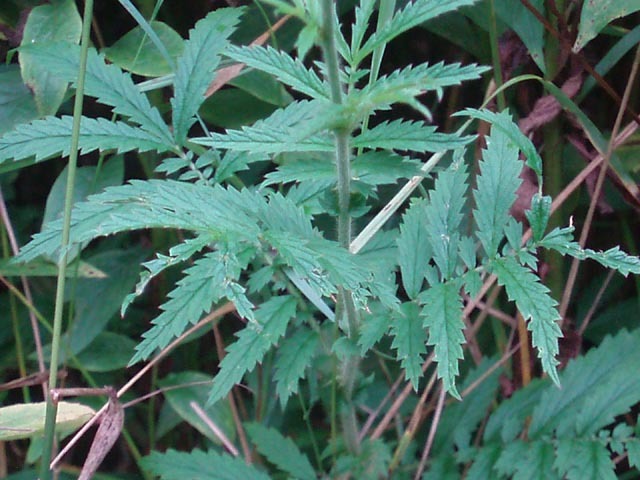 Serrated leaves divided into 3-5 leaflets. 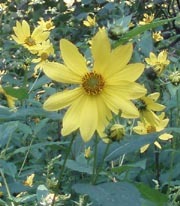 Nodding Bur-Marigold, Bidens cernua): Grows 1-3 feet. 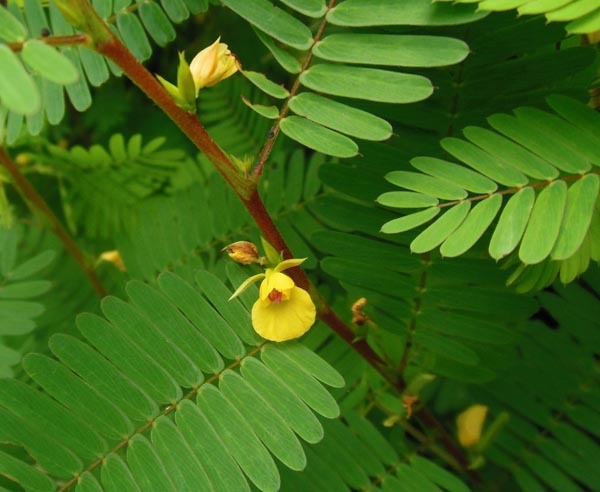 Thrives in wet, sunny places. 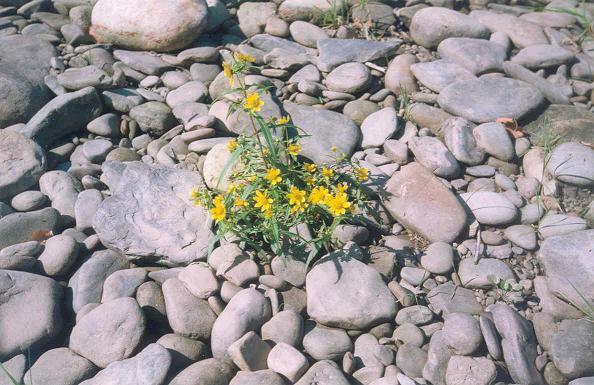 Location: Pine Creek, PA.
Whorled Coreopsis (Coreopsis verticillata): Note whorles of 3-forked, filamentlike leaves. 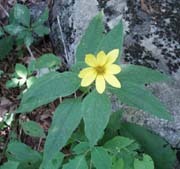 Location: Big Run Loop Trail, SNP, VA.
Thin-leaved Sunflower (Helianthus decapetalus): Large leaves taper into thin stems before attaching to the main stalk. "decapetalus" implies 10 petals. 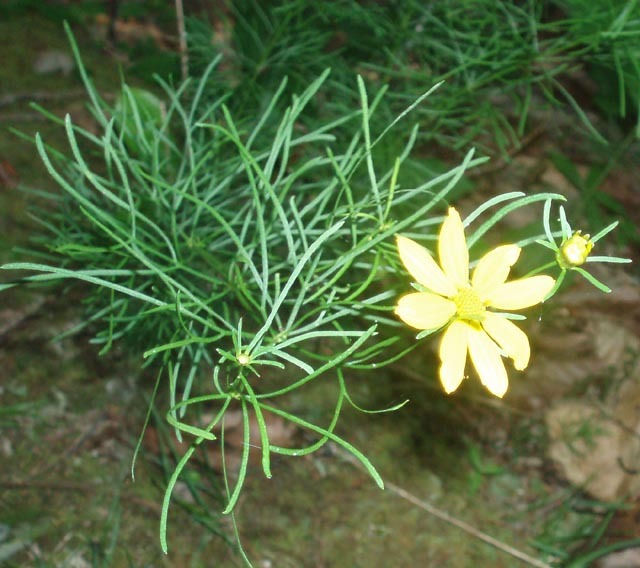 Location: AT in the Three Ridges Wilderness Area, GWNF, VA.
Maryland Golden Aster (Chrysopsis mariana) - You might think that this is in the sunflower family but it really is an aster. Location: Cape Henlopen. Photo by Ken Clark. 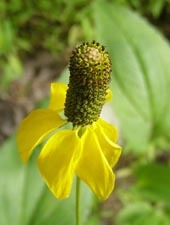 Green-headed or Cutleaf Coneflower (Rudbeckia lanciniata): Grows in open meadows and along edges. 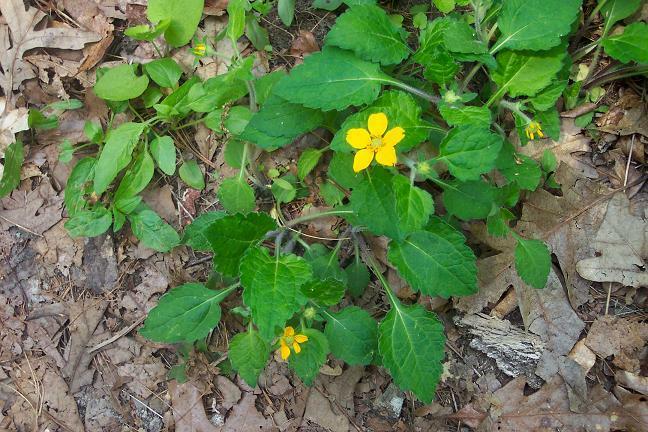 The green center and odd leaves help in its identification. 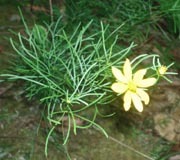 Usually the first pair of leaves under the flower is broad and lancelet. The next few sets will be tri-lobed, then penta-lobed and so on as you get further away from the flowers. Location: New River NR, WV. 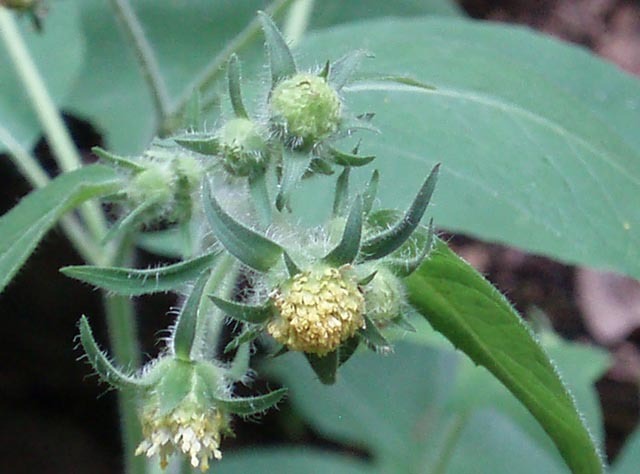 Upright Prarie Coneflower (Ratibida columnifera ): Has a much larger "seed button" than the pinnate Coneflower (R. Pinnata). Photo by Dimitri Tundra. 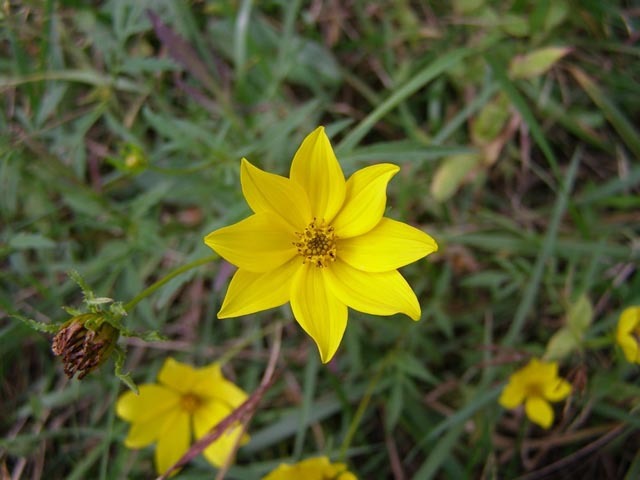 Tickseed Sunflower(Bidens Aristosa): Thrives in wet areas. 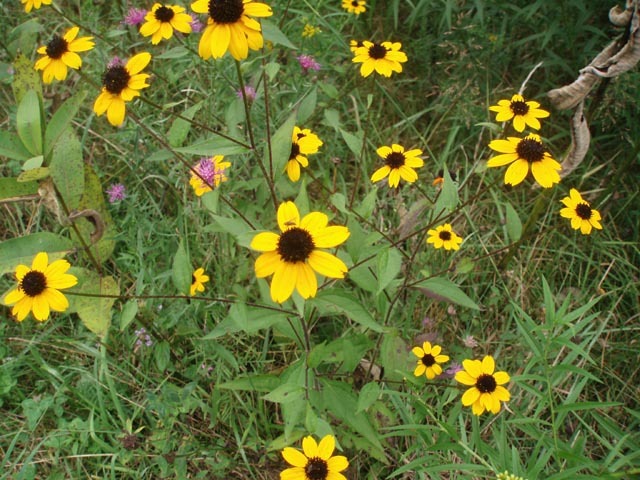 Blooms in late summer-early fall. Location: Otter Creek Wilderness, MNF, WV. 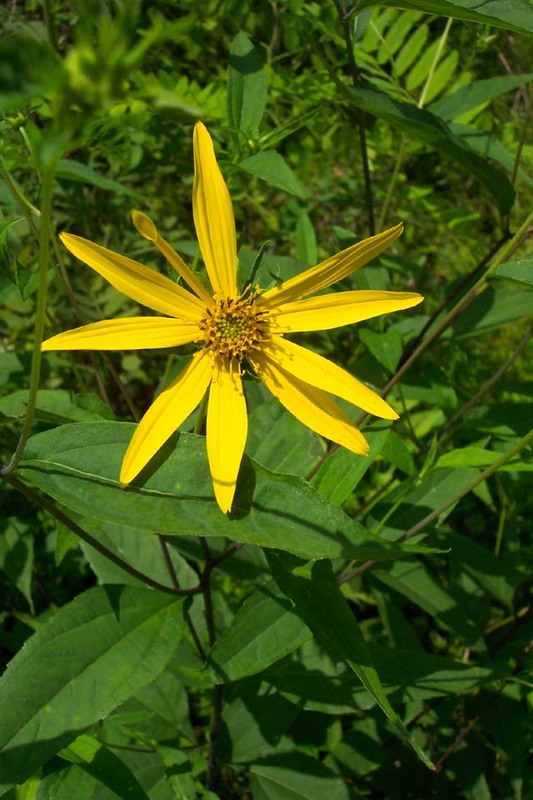 Jerusalem Artichokes (Helianthus tuberosus): A large sunflower growing 4-6 feet in height. 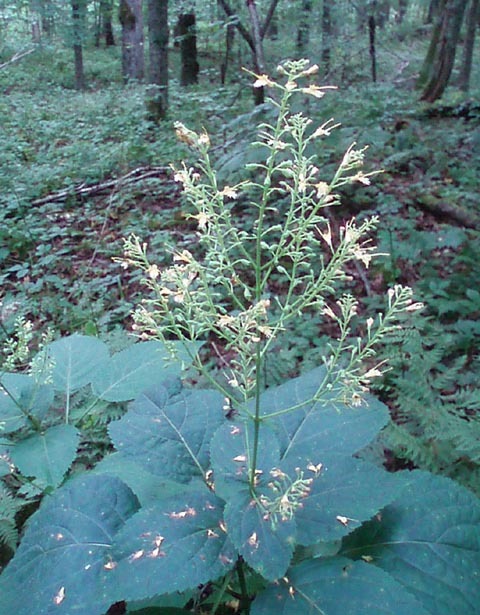 heavily veined, toothed leaves. 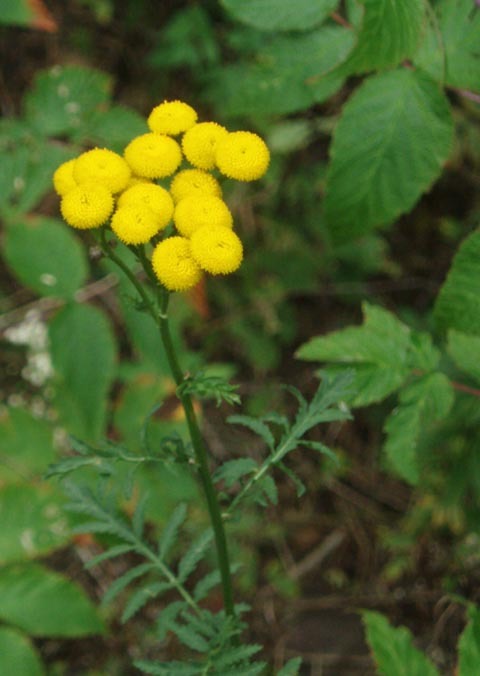 Grows in dense open thickets. 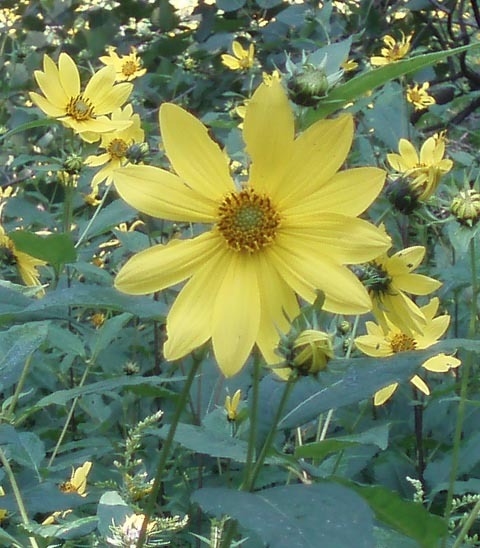 Location: Quehanna Wild Area, PA.
Woodland Sunflower (Helianthus strumosus): There are about 20 species of Sunflowers w/yellow centers. This is my best guess. The purple stem is striking. 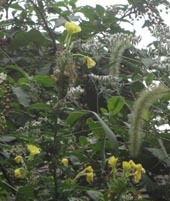 Have seen similar flowers with plain green leaves and stems, others with purplish leaves as well as stems. Can grow from 3 to 6 feet. Location: Kaymoor/Cunard Tr, New River NR, WV. Golden Ragwort, Packera aurea (Senecio aureus) : Prefers wet areas. Blooms April-July. Location: FR 70, near Boars Nest Trail, Roaring Plains, MNF, WV. 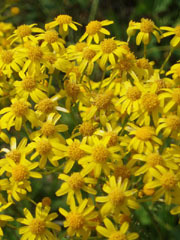 Wooly Ragwort (Senecio tomentosus): Similar to above Golden Ragwort but with thicker, hairier stems and leaves. Basal leaves oddly serated. Location: North terminus of North Fork Mt Tr, MNF, WV. 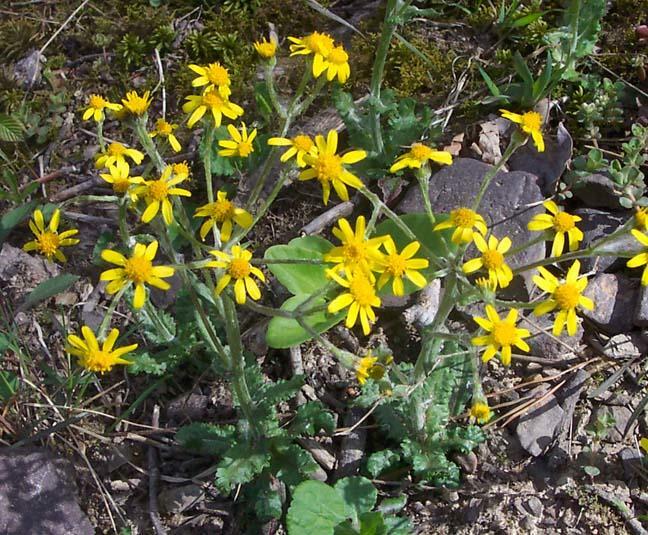 Round-leaved Ragwort (Packera obovata ): Thicker bouquets than above. Oval, toothed basal leaves. Location: Mount Rogers N.R.A., VA. Blooms in July. 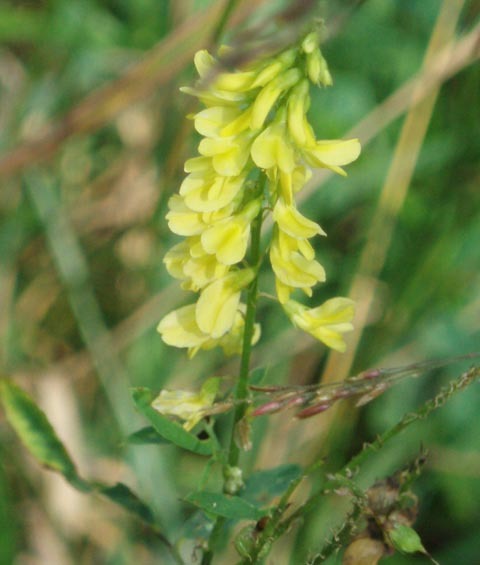 Butter-and-Eggs (Lineria vulgaris): In the Snapdragon family. A European introduction. Blooms throughout the summer. 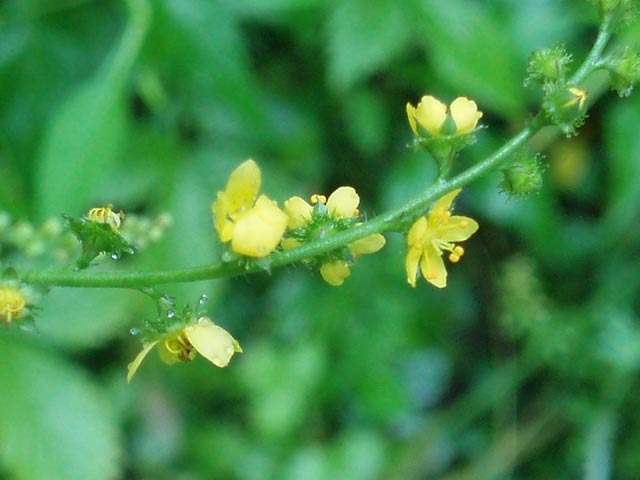 Individual flowers reminiscent of "eggs frying in butter". 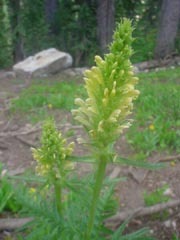 Location: AT - Tar Jacket Ridge, GWNF, VA.
Wood Betony or Lousewort (Pedicularis cacanadensis): In the Snap Dragon family. Can also be found in the wild in red or red/yellow. Domestic varieties come in even more colors. Blooms April to June. When the flowering is finished the hairy basal leaves lie flat on the ground. 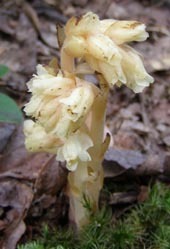 The flower body will resemble a pine cone. Photo by Anita Mueller. Smooth False Foxglove (Aureolaria laevigata): Grows in a semi-parasitic relationship with oak. Summer bloomer. 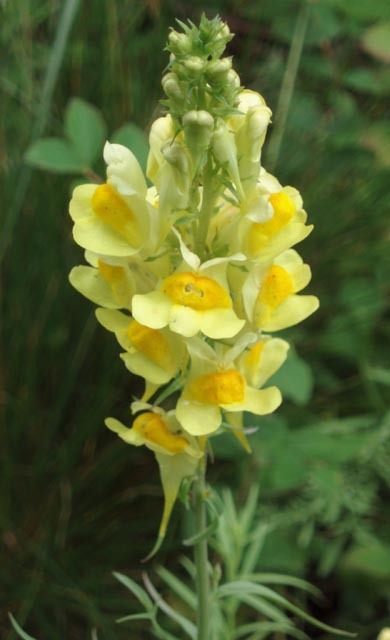 There are 3 varieties of False Foxglove all with similar flowers. Location: Rockytop Trail, SNP, VA.
Sweet Clover (Melilotus corniculatus): Alien. Sweet odor when crushed. Roadsides and waste areas. Location: Cranberry Backcountry, WV. 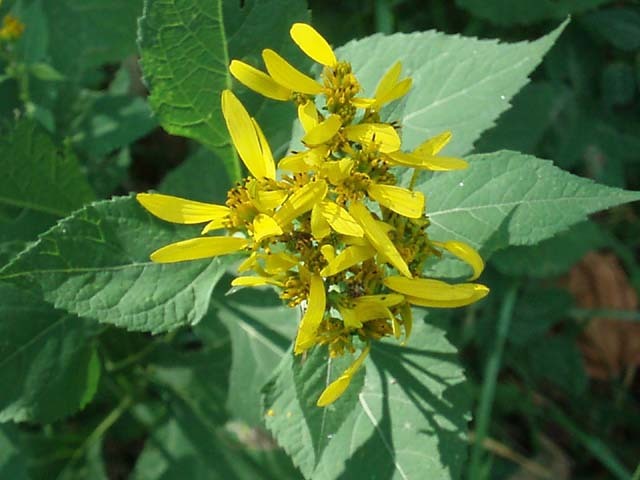 Horse-Balm (Collinsonia canadensis): Large, toothed, heart-shaped leaves on a square stem with a pyramidal branching head of lemon scented yellow flowers with red stripped stamens. Damp woods. 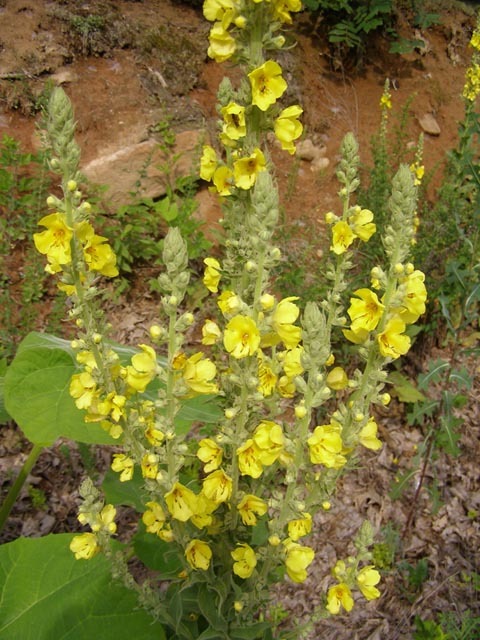 Location: Cranberry Backcountry, VA.
Common Mullein (Verbascum thepus): Grows over 5 feet. Large, fuzzy basal leaves. 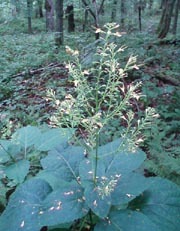 Single stalk. Roadsides, open places. Photo by Dimitri Tundra. 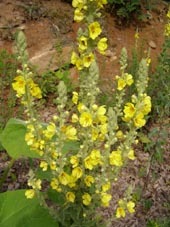 Moth Mullein (Verbascum blattria): Similar to above but with multiple btanches, smaller flowers. Photo by Dimitri Tundra. 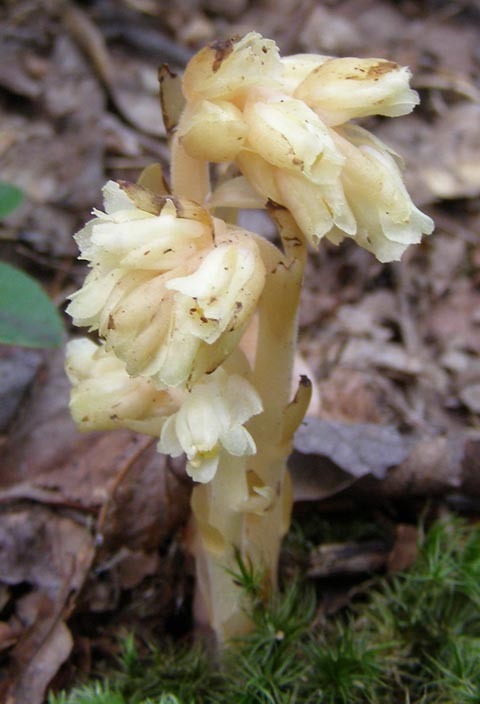 Pinsap (Monotropa hypopithys): (Similar to Indian Pipe (Monotropa uniflora) except yellow, not white, and multiple flowers, not single. Photo by Dimitri Tundra. Swamp Candles (Lysimachia terrestris): A Loosestrife. 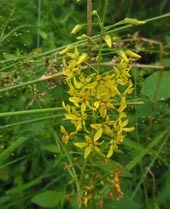 Terminal cluster of yellow flowers. Lanceolet leaves. Photo by Dave Bennick.